DJs love to perform but it isn't always easy to set something up on a moment's notice. Most DJ software controllers are designed to save DJs from having to lug around crates of vinyl or CDs. Just grab your laptop loaded with your music library, bring your controller and you're off to the gig. However, even the smallest DJ controllers range from being luggable requiring their own set of wheels. 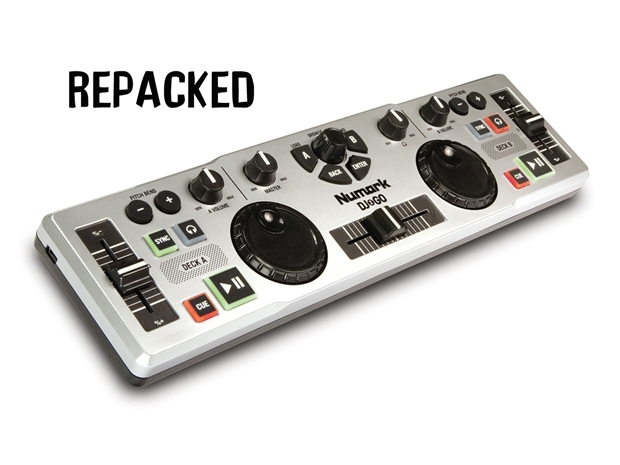 Numark has changed all that with DJ2GO. Now for the first time ever, DJs can throw their entire rig into a backpack and have room to spare. DJ2GO is a portable, affordable and highly capable DJ controller that allows you to control your favorite DJ software with a tactile feel that can't be matched using a computer mouse and keyboard. DJ2GO weighs just 13 oz. but provides a layout familiar to DJs that includes two platters, a crossfader, pitch and level controls as well as Deck A, Deck B, Master and Headphone gain controls. In addition, you can load and assign tracks to either of the two included deck control sections without ever touching a mouse. Sync and headphone buttons allow you to instantly sync two tracks and monitor either deck section. Included with DJ2GO is a special edition of Virtual DJ software, designed to mate perfectly with the capabilities of the controller, so you can pick up DJ2GO and literally start performing on the spot. Because DJ2GO is MIDI-compliant, it can be used easily with virtually any DJ software by simply re-mapping the controls in the applicable application. You need only to connect the included USB cable to their Mac or PC and install the software to be up and running. It doesn't get any easier to set up and perform a set than it is with DJ2GO. Includes integrated Virtual DJ LE Lite Software.